Alex Walker with Alan Watson Featherstone (Trees for Life) by the new office building. In 2013 we secured EU funding from the ERDF (the European Union’s European Regional Development Fund) for a new office building, completed in 2015 and now occupied by Trees for Life. 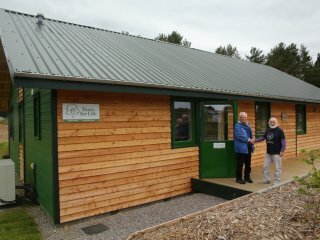 The environmentally-friendly office is based is based in the Findhorn Community. The building was built to high ecological standards with features including an air-source heat pump providing heating, high levels of insulation, double glazing and solar hot water. In 2007/2008 we received a grant from Co-operative Development Scotland to assist with the creation of a new model for co-operative housing. This enabled the successful creation of Station House Co-operative to take place and ultimately the purchase of Station House, Findhorn itself in November 2008. In 2006, with the generous support of Duneland Ltd. and the Soillse Cluster Group, we negotiated a new ‘Land Trust project’ which has enabled us to own some communal amenity land in Findhorn. In 2004 we received a total of £5,000 from Development Trusts Association Scotland (in turn supported by the European Community’s ‘Equal’ programme) to research the provision of affordable housing in the Ecovillage. In 2004 we received a Development Trusts Association Scotland small grant to assist us in visiting the Isle of Gigha Heritage Trust and Mull Iona Community Trust. The Isle of Gigha was planning a similar wind project to our own (now both complete) and MICT have set up a successful recycling project. 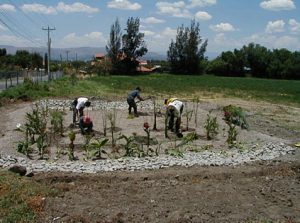 In the same year we received £5,354 from The Funding Network to enable us to support an Ecovillage Institute youth exchange initiative to rural Bolivia with the aim of providing improved water treatment organic waste composting and reforestation. This project was undertaken in collaboration with Aldeas Infantiles SOS, LookFar Connections and Ocean Arks International. In 2003 Ekopia was awarded a grant of £21,562 from the Scottish Community & Householder Renewable Initiative, administered by Highlands and Islands Enterprise’s Community Energy Unit. This grant was provided to support the plans for expanding the generation of electricity from wind turbines at the Park, Findhorn. In 2002 Ekopia received a grant of £1,000 from the Development Trusts Association ‘Knowledge and Skills Exchange’ programme to enable us to attend the DTA Annual Conference in Plymouth, England as part of a Scottish delegation.